Coke Winner Wonderland Giveaway: Play To Win Gift Cards! 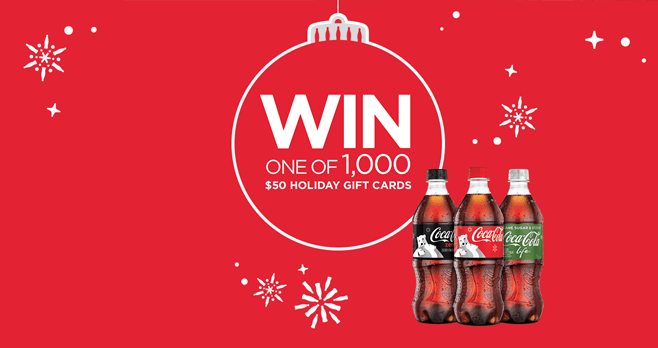 Get in the holiday spirit with the Coke Winner Wonderland Gift Card Giveaway! This holiday season, grab any 20 oz. Coca-Cola and look for a Coke Cap Code located under the cap. Then, play to win, instantly! You could be one of 1,000 lucky winners who will receive a $50 Amazon.com gift card. That’s $50,000 worth of holiday gift cards! Are you a lucky winner? There’s only one way to find out so get your cap code today and play to win online at CokePlayToWin.com/WinnerWonderland or via text message! What Is The Coke Winner Wonderland Gift Card Giveaway? The Winner Wonderland Gift Card Giveaway is open only to legal residents of the 50 United States (or the District of Columbia) who are 18 years of age or older at the time of entry. There is a limit of 3 Instant Win Game plays per person per day during the Promotion Period, regardless of method or combination of methods of entry or of requesting Codes. Total approximate retail value of All Prizes is $50,000. For a winner list, visit http://bit.ly/2cUjkKT. Sponsored by The Coca-Cola Company, One Coca-Cola Plaza, Atlanta, GA 30313. Administrated by HelloWorld, Inc., 3000 Town Center, Suite 2100, Southfield, MI 48075. During the Promotion Period, purchase any 20 oz. Coca-Cola product and obtain the unique code located under the cap. Between October 22, 2016 and December 20, 2016, you may receive a Code without making a purchase, by hand printing your name, mailing address, day and evening phone numbers, email address, and birthdate on a 3″ x 5″ piece of paper and mailing it with proper postage to “Winner Wonderland Gift Card Giveaway – Sweeps Entry,” PO Box 5023 Department 828574, Kalamazoo, MI 49003-5023. Between December 21, 2016 and December 31, 2016, you may request a Code online by visiting cokeplaytowin.com/WINNERWONDERLAND and following the links and instructions to complete and submit the Code request form, including a valid email address. You will receive a Code via automated email that you may use to play the Instant Win Game during the Promotion Period. Once you have obtained a Code, either text the keyword HOLIDAY to 26739 or go online to cokeplaytowin.com/WINNERWONDERLAND. Then, follow the links and instructions to input your Coke Cap Code. Your Cap Code will be automatically validated and you will receive 1 Instant Win Game play. You will be instantly notified if you are a potential winner of 1 of the Instant Win Game prizes. For complete details, including Official Rules, visit www.CokePlayToWin.com/WinnerWonderland. I just can’t enter HelloWorld sweepstakes for anything.They sell all your information world wide but also tell you they do.Your choice.U notice they ask for everything They don’t leave anything out.